Mass incarceration: Will the federal courts finally stand up and say prison overcrowding is unconstitutional? It’s time for the Supreme Court to weigh in. 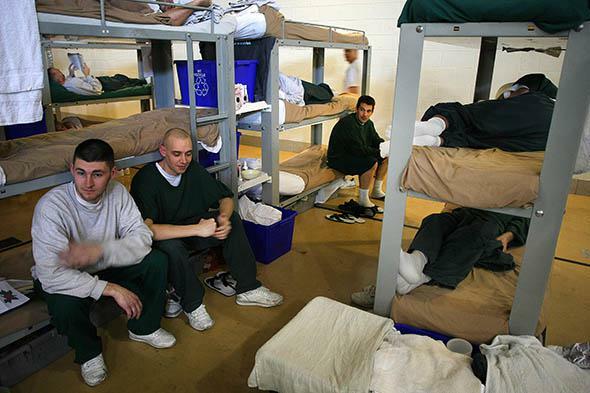 Inmates in triple bunks set up in the gym at the Norfolk County House of Correction, in Dedham, Massachussetts, May 3, 2012. The ongoing effort to address America’s mass incarceration problem has thus far focused on lawmaking. There are bills working their way through legislatures around the country that would reduce the severity of drug sentences, allow certain inmates to leave prison early by completing rehabilitation programs, and allow judges to be more lenient in doling out punishment. Advocates for reform have placed far less emphasis on the potential role of the appellate courts—institutions that have a long history of identifying systemic problems in American society and using their legal authority to force change, from Brown v. Board of Education to Gideon v. Wainwright. For the most part, the judges presiding over the country’s appellate courts have lately been staying away from issues stemming from mass incarceration, only rarely hearing civil rights cases brought by prisoners and ruling in their favor even less often. But according to one legal scholar, University of California–Berkeley professor Jonathan Simon, there is reason to think that’s about to change—that after almost three decades of reticence on the awful prison conditions that have resulted from overcrowding, federal judges might be on the verge of an awakening of conscience. Simon is author of the book Mass Incarceration on Trial, in which he tells the story of a 2011 Supreme Court case that resulted in California’s prison system being forced to address the fact that its facilities were being stretched so thin that they constituted a violation of the “cruel and unusual punishment” provision of the Eighth Amendment. Simon argues that the court’s decision in the case, Brown v. Plata, could mark the beginning of a new era in American jurisprudence—one in which the concept of “human dignity” becomes a legal weapon with which to hold prisons accountable for their treatment of inmates, and courts are emboldened to use their powers to compel state investment in prison health care and, where necessary, impose population caps. In your book you describe the possibility of “a legal dismantling of mass incarceration.” What are you imagining? It’s not that I think the Supreme Court is going to bring about a dismantling of mass incarceration, although in its way, Brown v. Plata, did that for California. But at least 40 percent of the states are in a serious overcrowding situation. And I think lawsuits have a role, as a stick to get really entrenched bureaucracies and really risk-averse politicians to take those steps that need to be taken, and to actually change the legal framework in which people get sent and kept in conditions of mass incarceration. Some people say I’m way too optimistic about it. But one thing to keep in mind is that, from the early ’60s to the late ’80s — after centuries of saying that prisons were basically off the table for court intervention — suddenly the federal courts, with enormous pressure from civil rights lawyers coming over from the civil rights struggle, began to look at the really wretched state of prisons — Southern prisons, especially — in that era. A huge amount got done, relatively speaking. Something like half the prison systems in the country were at one time under a court order, and many of them under multiple court orders. Now, there’s a lot of irony here in retrospect, because some sociologists now believe that this kind of judicial stimulus to invest in prisons, coming as it did in the 1980s while other political forces were aligning to make incarceration seem like a good idea, may have actually accelerated the rise of mass incarceration. But be that as it may, what it meant was the federal courts were tremendously involved in shaping prisons in this country during that 20- to 25-year period. And then they really fell silent. For a long time, our court system went into a kind of deep freeze when it came to prisons. What caused the deep freeze? The judiciary as a whole, the federal and the state judiciary that is, was in many ways put under pressure by the War on Crime. The several decades of mobilization at all levels of our government around safe streets, locking up criminals, more aggressive policing—within that climate, the courts were seen, at best, as bumblers who were kind of naively putting obstacles in the way of law enforcement and corrections officers in the name of being overly sympathetic to criminals. Institutionally, courts were on the defensive in this period. So it was the political climate? A political climate which then had a legal dimension. There was a series of Supreme Court decisions basically signaling to the lower courts: “Set higher standards before you say there’s a violation, be more restrained before you impose institutionally bothersome reforms.” And just like it doesn’t take the sun moving very far away from us in the winter to make the climate in the north much, much colder, the lower trial courts were very sensitive to those signals. It created new barriers to federal courts intervening in prisons. Then, after the Prison Litigation Act goes through in 1996, everything just flatlines. That law basically is the first law in our history that effectively strips the federal courts of jurisdiction to hear civil rights cases coming from prisoners. It’s a horrendous law that was justified as making it harder to bring frivolous lawsuits. But of course it ended up eliminating most of them. It created various sanctions for prisoners who file too many pro se—meaning self-written—lawsuits. But its most important effect was that it basically set huge barriers to a judge ordering significant institutional reforms in prisons. You’re optimistic that the Brown v. Plata decision could end the deep-freeze era, specifically because of a line that Justice Kennedy wrote in the decision about “human dignity.” What was the line, and why does it make you optimistic? The line was, “A prison that deprives prisoners of basic sustenance, including adequate medical care, is incompatible with the concept of human dignity and has no place in civilized society.” This language has been heard before, but not in a long time. When was it heard before? Right at the dawn of that era when courts began to get involved in prisons. Trope v. Dulles—a 1958 case. Justice Kennedy actually says dignity animates the Eighth Amendment. And this is important because our justices have always been fundamentally divided on the following question: Does the Eighth Amendment just prevent torture or does it protect something more? If it just protects us against torture then obviously it’s a very limited right and we have to wait until things get really awful in prisons before courts are going to do anything. But if torture is just being protected against because it’s one way to destroy and degrade “human dignity,” then I think almost everything we do in prison has to be rethought. Is there anything we know about what began that era in the ’60s that would tell us anything about what it would take for a similar era of judicial activity on prison activity to start now? Courts need a conviction in their stomach that something is really off the rails morally in terms of the way people are being treated, and some kind of legal space that they feel safe in, where they know they won’t get crushed by the appellate courts. And my hope is that Brown v. Plata is the sun moving a little closer to the Earth again in the summer. It doesn’t take the Supreme Court committing itself to end mass incarceration to send a strong signal to these lower courts. What does it take? It takes a generation of federal judges who see something with new eyes, or see something they haven’t seen at all before. And if they act on the moral sensibility that’s now been kind of reinvigorated with Justice Kennedy’s decision, then you have a combination of the sense that something’s fundamentally wrong and really morally off the track, with a greater confidence—encouraged by the Supreme Court—that there’s a safe doctrinal space in which court decisions to intervene will be respected.